Austin Horse is a rare breed: a professionally-sponsored bike messenger who recently spent two-and-a-half months on set as a stunt double for Joseph Gordon-Levitt in the Hollywood movie Premium Rush. He can usually be found biking up a mountain or racing other cyclists against crosstown traffic. If he wasn’t delivering packages, he says he’d be saving the world. And, well, he kind of is. 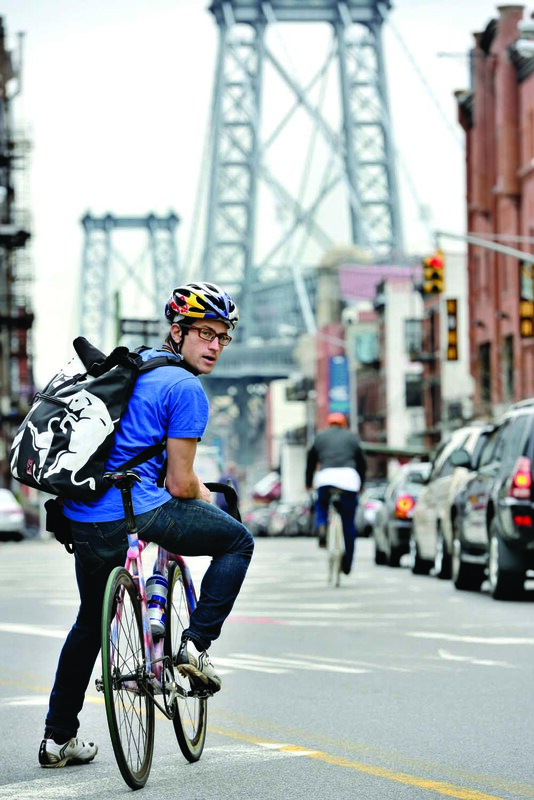 dandyhorse magazine asked one of the world’s fastest urban riders what he thinks would make city streets safer for cyclists and about his gig as a volunteer at the New York City–based not-for-profit group Time’s Up! “It’s incredibly important that we change the basic way we live if we’re going to sustain the planet – and changing transportation is a huge part of that,” says Austin Horse when asked about his work with the direct-action environmental group. At Time’s Up!, Horse helps run both the bike co-op, teaching people how to fix their own bikes, and the bike recycling program, where old bikes are fixed and sold at low cost. Time’s Up! garnered international headlines in early 2013 when members spray-painted outlines of bodies on pavement where cyclists and pedestrians had been killed by a driver who was committing at least one traffic infraction but was not charged criminally. This garnered positive media attention. He adds it’s “not all sunshine and roses” for cyclists in New York, despite all the attention that new bike lanes and the like have received. “In New York City, we are getting a lot of ticketing from cops. I think right now among my cycling friends, the threat of a ticket is one of the most effective things as far as stamping out enthusiasm to ride a bike. The penalties feel out of proportion to the threat and harm that a bike can pose. All the cars that run a red light three seconds after it turns should be fined $500 or $250, but instead it’s a lot easier for cops to get the cyclist at the T intersection, with no traffic, on a winter morning… Sure, they’re also issuing traffic citations to motor vehicles, it’s a big police force, but in 2011 more tickets were issued to cyclists than to trucks,” says Horse. “It is way out of proportion.” He adds that he thinks police are just going after cyclists to help fill their ticket quota. Cyclists are getting ticketed for “not riding in the bike lane.” This may seem egregious to us Canadians (especially with Toronto’s bike lane dry spell), but it became an Internet sensation last year when actor and stunt person Casey Neistat made a short film about getting ticketed for not riding in the bike lane. Horse, a Houston native who’s been in N.Y. since 2005, has yet to receive a ticket himself. In spite of everything, he says N.Y. is still one of the safest cities in the world to ride in, and it’s also his favourite. He’s ridden in about 30 cities worldwide, with Mexico City, Tokyo and Copenhagen among his other favourites. “In N.Y., the congestion has benefits for me as a city cyclist, because it slows down the cars that are passing me – which feels safer,” Horse says. This article originally appeared in dandyhorse's Summer 2013 issue. Buy it here.